LLASCC represents a diversity of residents from throughout Santa Cruz County. We are dog owners, foster dog owners, former dog owners, and those with no dogs. We support animal welfare, including domestic and wild animals and we support and regulations that foster such welfare. We consider the current county leash law to be the best means to insure the welfare of dogs, public safety and protection of the environment. We support County Animal Services in the myriad ways they work tirelessly to manage an almost out of control proliferation of domestic animals in the County, especially dogs and cats, whose numbers increase daily. We support their continued enforcement of the County leash ordinance, to provide for public safety and the welfare of all dogs, in all public places (streets, parks, the beach). We support adequate funding so they may do their jobs. To this end, we support increased focus on getting dogs licensed, since less than 15% of dogs in the county are licensed, leaving most pet owners as part of the problem and not contributing to a solution. We oppose the establishment of off-leash hours at County beaches and support, instead, additional fenced dog off-leash play areas, where appropriate. LLASCC wholeheartedly supports the ASA recommendation for off-leash dog play areas, passed unanimously by its Board of Directors on 13 August 2012, after two separate public hearings and four hours of testimony. The ASA Board realized that it is not in the business of land use planning and was therefore not equipped to consider a proposal for off- leash hours at local beaches. In its recommendation, sent to the Chair of the County Board of Supervisors on 15 October 2012, the ASA Board wisely reiterated exactly the purpose of the Animal Shelter's mission; that is "to provide animal rescue, regulation and humane care that protect the health, public safety and welfare of people and animals in Santa Cruz County." Since the ASA Board is a Joint Powers Authority and serves the County of Santa Cruz, City of Santa Cruz, City of Scotts Valley, and the City of Watsonville, with representatives from each of the participating jurisdictions, their unanimous vote is particularly meaningful. - makes it clear that ASA has no jurisdiction regarding the designation of these off- leash areas and that we take no position on designating specific off-leash areas within their jurisdictions but that we request that at an appropriate time, that the jurisdictions consider the possibility of examining enclosed or otherwise fenced or confined off- leash areas in the future which recognize public safety, environmental well being and the well being of the animals. An organized group of dog owners is lobbying Santa Cruz County government to allow dogs to run off-leash on County beaches. In response to renewed enforcement of long-standing County dog leash laws, some dog owners are demanding special consideration and exception from leash laws to allow them to let their dogs run loose on County beaches. 6. A considerable portion of the beach from 19th to 26th Avenue consist of private property extending to the Mean High Tide Line. County Code is very specific in not allowing dogs off-leash anywhere in the County, at any time. In order to allow off-leash dogs on County beaches, the County would have to amend Section 6.12 to provide for specific exceptions. Such an amendment would provide argument for weakening County Code to allow off-leash dogs to run toff-leash throughout the County at any time. Such an exception would become a precedent that could be used to further weaken the leash law. 2. The County's Local Coastal Program (LCP) of its General Plan directs the County to “Enforce leash laws to the fullest extent possible.” In some cases, dogs may be prohibited from beach areas designated as Sensitive Habitat, leashed or not (5.3.2). Allowing dogs to run loose on County beaches enables disturbance of wildlife, which is specifically forbidden by federal law. National Marine Sanctuary guides for public use of beaches within National Marine Sanctuaries specifically address problems caused by allowing dogs to run free within the Sanctuaries. "Wild animals can injure and spread diseases to pets, and in turn, pets can harm and disturb wildlife. For example, wild animals recognize dogs as predators and quickly flee when they see or smell dogs. If you are traveling with a pet, always keep them on a leash and away from areas frequented by marine wildlife. "The Monterey Bay National Marine Sanctuary is home to endangered and threatened species under the federal Endangered Species Act and the California Endangered Species Act. Enforcement of both federal and state Endangered Species laws in the Monterey Bay National Marine Sanctuary is conducted by the California Department of Fish and Game." 5. On March 13, 2013, the US Fish and Wildlife Service issued its final ruling on Critical Habitat for the federally endangered Tidewater Goby. This listing includes Corcoran Lagoon, and designates the beach from the lagoon to the Mean High Tide Line, from 19th to 23rd Avenue as Critical Habitat. (See Section 7, Applicable City, County, State and Federal Lws). This means that the Corocoran Lagoon beach is designated as Sensitive Habitat under the County’s General Plan and LCP, and as Environmentally Sensitive Habitat under the California Coastal Act. 6. The beach from 24th Avenue to Moran Lake Beach is divided into private lots that extend to the Mean High Tide Line, separating the Moran Lake Beach from Corcoran Lagoon Beach. The County of Santa Cruz may not declare private property as a public use area for off-leash dogs. A proposal to designate off-leash dog hours on County beaches is not a simple issue. The considerations are complex. It will take a lot of time and money from an already stretched County budget in order to create legally sanctioned off-leash use of the beaches. 1. An initial environmental impact assessment (EA) of the proposed leash law amendment that must be rigorous, not perfunctory. Such an EA would no doubt lead to a full Environmental Impact Report (EIR) under CEQA because of the endangered species habitat at the beach and also because of the cumulative impact of creating precedent setting use that may well spread up and down the coast of the Monterey Bay Sanctuary. 3. An Incidental Take Permit application to either the CA DF&W and/or the USFWS. 1. Alternative analysis of off-leash play areas at County inland parks that can meet the objectives of the proposed project. 2. Mitigation of continued harm to Snowy Plover habitat. 3. Mitigation of continued harm to Tidewater Goby habitat. 4. Description of endangered species and their habitats including the impacts of current off-leash dog use. 5. Description of anticipated further habitat degradation due to the proposed LCP amendment. Since dogs running off-leash pose a threat of harassment to marine wildlife, including state and federally listed endangered and threatened species, on beaches bordering on the Monterey Bay National Marine Sanctuary, we recommend that the County not allow any dog off-leash hours on County beaches. Such a sanctioned activity contradicts state and federal laws and long established Santa Cruz County Code. Granting exception for off-leash dogs on County beaches would place the County in opposition to state and federal regulatory agencies. We do support the establishment of off-leash dog areas in existing inland parks, as analyzed in this proposal. These areas would be fenced, with an entrance gate, thus assuring safety for both dogs and their owners as well as other park users. Dog owners can already use the beaches 365 days a year, at all hours of the day, if their dogs are leashed. We think that time and funds would be better spent on enhancing single- use dog play areas in existing inland County parks, scattered throughout neighborhoods where people and dogs live. One task of government is to balance conflicting desires in public spaces, sometimes referred to as the commons. To this end, governments have created a body of law to regulate human activities and to guide local agencies in regulating development in public spaces, for the common good. In reading the Staff Report for your consideration tonight, LLASCC is pleased to see that Staff has addressed the same body of law about which we have spoken at two previous public hearings and which is the subject of our January 15 proposal. LLASCC wholeheartedly supports the Staff Report before you, in its entirety. In addition we would like to add an important piece of information for your consideration. Since the LLASCC proposal was first submitted on January 15, 2013, the US Fish and Wildlife Service published its designation of Critical Habitat for the federally endangered Tidewater Goby. Included in the Fish & Wildlife designation of Critical Habitat is an area that encompasses Corcoran Lagoon and its lagoon outflow to the ocean, including all of the beach from 20th to 23rd Avenues. Please see page two for the designated boundary. 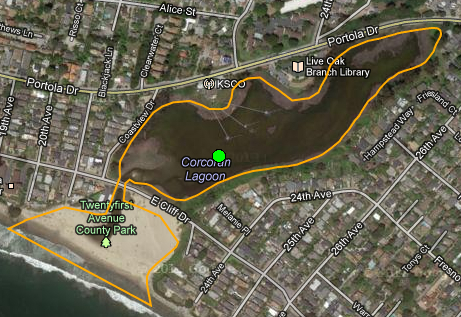 This is the core area of the LOOLA proposal for off-leash hours on the beach between 20th and 26th Avenues. Although the public response from one off-leash dog advocate was "they're just little fish," it is the risk of extinction not the size of the species that matters under the law. Dogs are now banned at Scott Creek Beach (critical habitat for the endangered Western Snowy Plover). The US Fish & Wildlife Service’s 2007 Recovery Plan for the Pacific Coast Population of the Western Snowy Plover, Section D. 5. b. ii., cites extensive evidence documenting the adverse effects of off-leash dogs on shorebird viability. In light of the Critical Habitat designation for the Tidewater Goby at Corcoran Lagoon, the question before the County now really becomes whether or not to allow dogs at all on the Corcoran Lagoon and adjacent beaches, not one of allowing dogs off leash. At a minimum, to address its responsibility under the Endangered Species Act, until the County determines whether Tidewater Goby Critical Habitat at Corcoran Lagoon, plus the documented presence of nesting shorebirds, requires a complete ban on dogs on this beach, the County must not promulgate a policy change to allow off leash hours as proposed. AGENCY: Fish and Wildlife Service, Interior. ACTION: Final rule. SUMMARY: We, the U.S. Fish and Wildlife Service, designate critical habitat for the tidewater goby (Eucyclogobius newberryi) under the Endangered Species Act of 1973, as amended (Act). In total, approximately 12,156 acres (4,920 hectares) in Del Norte, Humboldt, Mendocino, Sonoma, Marin, San Mateo, Santa Cruz, Monterey, San Luis Obispo, Santa Barbara, Ventura, Los Angeles, Orange, and San Diego Counties, California, fall within the boundaries of the critical habitat designation. DATES: This rule becomes effective on March 8, 2013. SC–6 consists of 28 ac (11 ha). This unit is located in Santa Cruz County, approximately 3 mi (4.8 km) east of the City of Santa Cruz. This unit consists of 1 ac (less than 1 ha) of State lands, 6 ac (2 ha) of local lands, and 21 ac (8 ha) of private lands. SC–6 is located 4.0 mi (6.4 km) south of Moore Creek (SC–5), and the unit is separated from the nearest extant subpopulation to the south, in Moran Lake (not designated as critical habitat), by 0.7 mi (1.1 km). Some have said that the County laws regarding off-leash dogs are outdated and should be amended to reflect current public attitudes with regard to domestic pets. These County laws were written decades ago in response to clearly perceived threats posed by unrestrained dogs to public safety, to other domesticated animals and to wildlife. In the ensuing years, the human population of the County has grown from 84,000 to more that 260,000 residents, with the dog population blooming to more than an estimated 50,000 animals. Tourist visitation has increased significantly, including an increase in numbers of visitors bringing their dogs to the beach to run off-leash. This burgeoning population has resulted in increased conflicts among humans, dogs off-leash, leashed dogs and wildlife. County leash laws are not outdated, they are more pertinent than ever and must be maintained to deal with increasing conflicts in shared public spaces. Access to shared public space is the right of all people. Is it wise to promulgate a policy that says that some must stay away from the beach at certain times of the day, a policy that disenfranchises some people in order to benefit others? Such a policy would essentially create a "sacrifice zone" where public safety, the well-being of alls dogs and protection of the environment would be officially set aside. In summary, strong County leash laws are required to adequately address conflicts over differing desires for use of public spaces, including County beaches. First and foremost this Commission has a responsibility to provide safe recreational opportunities for people (especially the more vulnerable, e.g., children, elderly). The beach area is not an appropriate public space to allow off-leash dogs due to inherent threats from unrestrained dogs to public health and safety in public spaces, and to sensitive habitat and species, including designated Critical Habitat for federally endangered species. The complex multi-jurisdictional regulatory environment of the California coast precludes any unilateral declaration by local agencies allowing off-leash dogs on the beach and would require extensive time and resources to legally permit such activity. 1) Forward the Animal Services August 2012 recommendations to the Board of Supervisors with your advice to accept them in their entirety. 2) Recommend that the Board of Supervisors not allow off-leash dogs on County beaches, to protect public health and safety, to protect other leashed dogs, and to protect sensitive habitats and species.